Founded in 1852, the American Society of Civil Engineers currently represents more than 144,000 civil engineers worldwide and is America’s oldest national engineering society. The following synopsis summarizes the history of the Wisconsin Section of ASCE. An appropriate starting point is to examine how the Wisconsin Section fits into the overall ASCE structure. Nationally, ASCE is governed by officers and directors elected from the membership to represent ten geographical areas known as Regions, and seven technical specialties known as Institutes. The Wisconsin Section is a part of Region 3, which has a total membership of 13,859. The Wisconsin Section membership is currently 2,072, making it the third largest section within Region 3. The national President and two directors are elected at-large. Ten directors are elected by regional membership and two directors are elected by Institute membership. 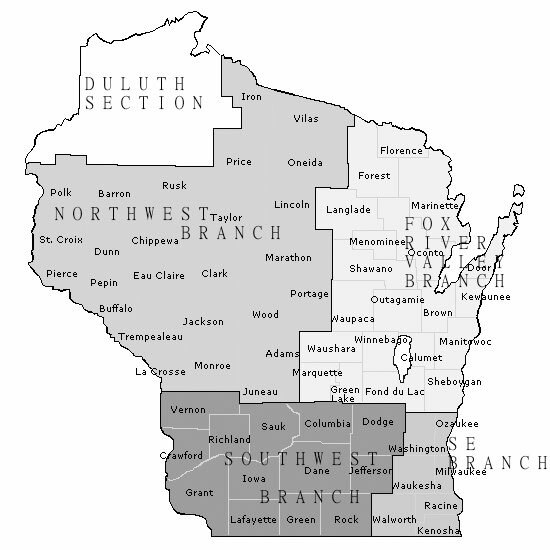 The Wisconsin Section covers entire state except for six northwestern counties (Ashland, Bayfield, Burnett, Douglas, Sawyer, and Washburn) which are assigned to the Duluth Section. The section is composed of four branches corresponding to the four major geographic areas where there are concentrations of members, as shown on the next page. The Southeast Branch is composed of the seven counties in the Milwaukee metropolitan area, containing over one half of the section membership. The Southwest Branch is composed of thirteen counties in the south central and southwestern part of the state and has over one quarter of the members. The Fox River Valley Branch is composed of twenty counties in the northeastern part of the state located around the city of Green Bay. The Northwest Branch is composed of twenty-six counties in the north central and northwestern part of the state centered around the City of Eau Claire. It is the largest branch by area, but the smallest by membership. The branches were formed to better serve the members and provide increased local activity. Each branch has its own constitution, bylaws, and officers and holds regular monthly meetings. All members are assigned to their respective branch based on the county of their mailing address. The Wisconsin Section is widely recognized by the national office as a very active and prominent group, and has often been honored with ASCE’s Outstanding Large Section Award. A number of section members serve on national professional and technical committees. The affairs of the Wisconsin Section are vested in and governed by the Section Board of Directors composed of officers, directors at-large from the section area as a whole, and one director from each branch. The ASCE Wisconsin Section was originally organized as the Milwaukee Section. The Milwaukee Section started on March 20, 1923, when eleven members of ASCE got together to discuss the feasibility of forming a section. Temporary officers were elected, committees appointed, other members notified, and a constitution drawn up. With a few suggested amendments, the Section was approved by the ASCE Board of Directors meeting in New Orleans on April 16, 1923. These amendments were adopted and, subsequently, on February 5, 1924, the permanent constitution was established, officers were elected, and twenty-three members were enrolled. On May 20, 1924, seven more members joined. Several meetings were held jointly with the Engineers and Scientists of Milwaukee (ESM) and in September 1926, a contract was signed affiliating the two groups. Meetings of the Section were held in various locations in the city. When ESM purchased a building at 3112 West Highland Avenue, most meetings were then held at the ESM Building. In April 1938, the Milwaukee Section changed its name to the Wisconsin Section. Until 1962, the officers consisted of president, first and second vice-presidents, and a secretary-treasurer. In 1962, the latter offices were separated. In 1969, the office of president-elect was created, replacing one of the vice-presidents. As mentioned, four branches have been established—Madison in 1962, Fox River Valley in 1966, Northwest in 1974, and Southeast in 1977. In 1995, the Madison Branch was renamed the Southwest Branch to more accurately indicate the Branch membership. There are five student chapters in the Section located at the University of Wisconsin-Madison (established in 1921), University of Wisconsin-Platteville (established in 1967), University of Wisconsin-Milwaukee (established in 1970), Marquette University (established in 1923); and at Milwaukee School of Engineering (established in 1991). Annually, awards are made to the outstanding senior student members of each student chapter. The Section has thirteen standing committees and seven technical committees whose duties and scopes are outlined elsewhere. Committees of the section also work with and advise the student chapters. The Board of Directors assigns its members to maintain contact with these committees. These committees report their activities and accomplishments periodically to the Board and annually summarize their activities for incorporation in the Annual Report. Under ASCE’s prior governance system, the Wisconsin Section originally provided delegates to sit on the District 7 Council. Since 1914 seven members of our section have served as director of District 7. In 1982, the Section was transferred to District 8. Four section members, Don Dupies, Luther Graef, Jeff Russell, and Tom Walther, have served as directors of District 8 and the present Region 3. Under current governance, the Wisconsin Section is represented on the Region 3 Board of Governors by Darrell Berry. ASCE presents several annual awards at a National level. Many members of the Wisconsin Section have been recipients of these awards, and are listed in this Yearbook. The Milwaukee Council of Engineering and Scientific Societies and now Engineers and Scientists of Milwaukee (ESM) have since 1953 annually designated an outstanding engineer as “Engineer of the Year”, making this award at a dinner meeting in February during Engineer’s Week. Members of the Wisconsin Section who have been recipients of this honor include Robert Johnson, Lloyd Knapp, Sam Gates, Herb Goetsch, Al Striegl, Joe Looper, Ray Kipp, Ed Korpady, Charles Yoder, Hank Wildschut, Bill Murphy, Luther Graef, Len Anhalt, Dave Kuemmel, Kurt Bauer, and Dave Kluge. In 1967, the Wisconsin Section of ASCE began making awards for the “Outstanding Civil Engineering Achievement”. In 1987, the awards program was expanded to three categories and in 2000 to four. Category A is for projects with construction costs of less than $2 million, Category B for projects with construction cost of $2 to $10 million, Category C for projects with construction costs of $10 to $20 million, and Category D for projects with construction costs greater than $20 million. The Section has the option to nominate one or more winners in each of the categories and to name one particular project in any category as the national Outstanding Civil Engineering Achievement (OCEA). The Milwaukee Art Museum Addition was nominated for and won the national OCEA Award in 2003. The Section’s other awards include the Distinguished Service Award of the Year, The Young Civil Engineer of the Year, and Engineer’s Merit Awards for Engineers in Education, Consulting Practice, Government Service, and Private Practice. The list of recipients of these awards is published in the Yearbook. The Historic Civil Engineering Landmark (NHCEL) program recognizes historically significant civil engineering projects, structures, and sites. In 1974 ASCE designated the Milwaukee Metropolitan Sewage Treatment Plant as a National Historical Civil Engineering Landmark and on August 29, 1974, Charles W. Yoder, National President, presented a bronze plaque to the Metropolitan Sewage Commission. It was accepted by Raymond D. Leary, Chief Engineer and General Manager of the plant. Section President Philip G. Sikes presided at the meeting which was attended by about fifty people, including the members of the Commission, Congressman Clement Zablocki and members of the Wisconsin Section. This was the first such designated landmark in Wisconsin. In 1977, ASCE, in cooperation with the American Society of Mechanical Engineers and the Institute of Electrical and Electronic Engineers, jointly designated the Vulcan Street Hydro-Electric Plant in Appleton a National Historic Civil, Mechanical and Electrical Engineering Landmark. On September 15, 1977, a bronze plaque was unveiled at a replica of the plant at 807 South Oneida Street, in Appleton, recognizing it as the first Edison hydro-electric central station to serve a system of private and commercial customers in North America. Present at the dedication ceremony were William G. Gibbs, ASCE President-Elect; Ralph Wallace, ASCE Vice-President; Harvey Shebesta, Wisconsin Section President; and officers from ASME, IEEE, and the Wisconsin-Michigan Power Company. In 2002 ASCE’s History and Heritage Committee designated the Marshall Building, 207 East Buffalo Street, Milwaukee, as a NHCEL. Designed by civil engineer Claude A.P. Turner and constructed in 1906, the Marshall Building is the oldest existing example of flat slab concrete construction in the world. Turner’s flat-slab system differed from previous reinforced concrete construction in that it consisted only of a slab and supporting columns, eliminating the time and expense of formed beams on the underside of the floor. The system was a source of intense debate and controversy when introduced. However, within a few years the method was embraced by the civil engineering community. By 1913 over 1,000 such buildings had been constructed. ASCE national president-elect Thomas L. Jackson, P.E., F.ASCE, dedicated the building in a ceremony on September 27, 2002, at the Marshall Building entrance. The Architects and Engineers Registration Board was established in Wisconsin by statute on July 10, 1931. Leslie Van Hagen, Robert C. Johnson and James L. Ferebee were the first members of the ASCE Wisconsin Section to be appointed to the Board by the Industrial Commission. Since that time, a member of ASCE has been continuously appointed to this Board of Examiners. On September 5, 1935, the name of the Board was changed to Architects and Professional Engineers Registration Board. Currently, the Board is named the Joint Examining Board of Architects, Landscape Architects, and Professional Engineers. On July 9-10, 1929, the 59th annual convention of ASCE was held in Milwaukee with a registration of 342. On May 13-17, 1963, the Wisconsin Section was host to the National Meeting on Water Resources. Registration included delegates and students from 42 states and 4 foreign countries. On July 16-20, 1972, the Section hosted a National Meeting, the National Transportation Conference. On June 26-30, 1994, Milwaukee was the site of the National ASCE sponsored International Conference on Marinas, Parks, and Recreation Developments. On June 20-24, 2002 Madison was the site of the ASCE 150th Anniversary Student Chapter National Conference. At the earlier regular Milwaukee section meetings, various subjects were presented by well qualified speakers. Subjects included, of course, technical engineering topics often presented by the members, discussions of new products, and new methods of construction. Speakers on banking, legislation, unionism, legal questions, and others broadened the scope of the meetings. Often an afternoon tour of a project was followed by the evening dinner meeting. Tours were conducted through many industrial plants—Allis-Chalmers, Bucyrus-Erie, Marquette Cement, Wisconsin Bridge and Iron Works, to name a few. Construction projects were toured, such as the Greek Orthodox Church, the Mitchell Park Domes, the Harbor Bridge, Marine National Bank Building, and the First Wisconsin Tower. Among national laboratories visited were the Forest Products Laboratory at Madison, the Paper Institute at Appleton, and the Portland Cement Association Laboratory at Skokie, Illinois. Other special events included Ladies’ Night meetings usually held in May and family outings in late August. With the formation branches within the section, meetings and special events are now scheduled on a branch basis with only Section meetings being the annual meeting in the fall and the technical conference in spring. The Section’s annual meeting was held each December until 1963, when it was changed to September at the same time that the fiscal year was changed to run from October 1 to September 30. Since 1971, the annual meeting has been an all-day affair that includes technical sessions, timely topics of the day, and award presentations. The spring technical conferences started in the late 1980s and are afternoon and early evening meetings, usually held in March. Younger Member Groups have been established in the Southeast Branch and the Fox River Valley Branch to supplement section and branch functions with programs that are particularly designed for members age 35 and under. They have established themselves as vibrant groups with their own officers and social programs. The section newsletter started in 1958 as means of communication and contact with the membership. It contains information on recent and upcoming Section activities, including the Section Board Meetings, as well as branch meetings. It also contains the president’s column and many other items of interest. Each branch also publishes a newsletter. Around 2007 the Section began sending some of the newsletters electronically as email messages. The section web site was established in 2000 to supplement the newsletter and to allow dissemination of section information to members via the internet. Similar to the newsletter, it contains information on recent and upcoming section activities, a list of all committees and their members and a library of minutes from Board of Directors meetings. The website underwent a major updating in 2010. The Southeast, Southwest and Fox River Valley Branches, as well as the Southeast Branch Younger Member Group and the Marquette University, Milwaukee School of Engineering, University of Wisconsin-Madison, University of Wisconsin-Milwaukee, and University of Wisconsin-Platteville Student Chapters, have also established individual web sites.